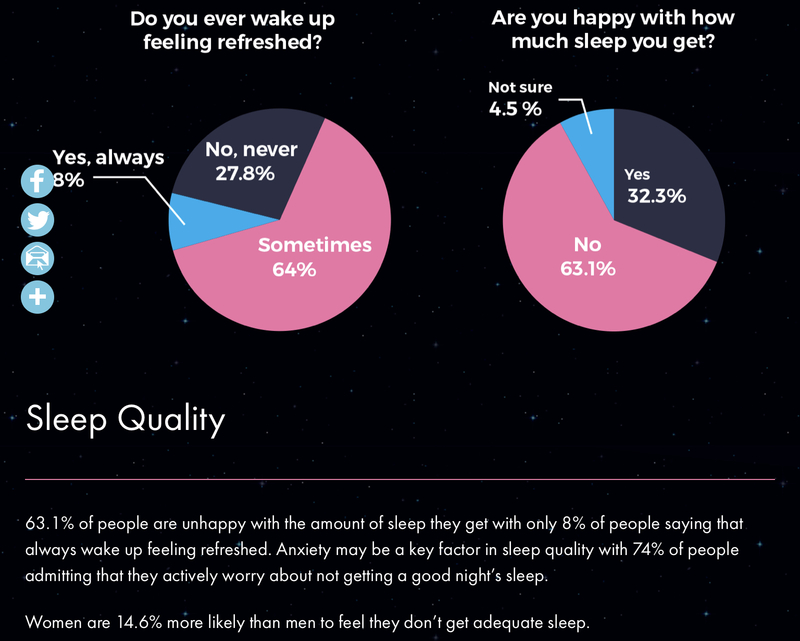 Around two thirds of the UK population are unhappy with the amount of sleep they regularly get. That’s a lot of people not happy with about one third of their day, that’s a big chunk of people not in a good place. Some health experts would argue “sleep is king”! If you want to be healthy, lose weight and live a long and prosperous life you need make the most of your shut eye. There is a link between deficient sleep and heart disease, stroke, high blood pressure, diabetes and kidney disease. As you can see with the above graphic your body first of all prioritises the processes responsible for repairing the physical damage of the day whether that be from a workout, painting the ceiling or those stiff aching muscles that you get from being stuck behind your desk all day. Then it focuses on repairing your mental function. So if you have trouble falling asleep you can see that waking up the next day, all rested and ready for your morning workout with your muscles not aching is less likely. Waking up and not getting back to sleep round the 2-4am time can lead to you feeling like you are just not on it when you are work, feelings of brain fog and struggling to concentrate would be typical and understandable. When you struggle to fall asleep but want to keep hitting the gym you need to factor, lack of sleep and at that time of the day in to your expectations on the benefits from exercise and when to push it and when to back off or take a day off. Taking one of those popular pre-workout stimulants or an extra shot of caffeine wont actually heal your muscles in time but only encourage you to use your stress hormones that bit more than they should be used which has the long term effect of further slowing progress towards your health and fitness goals as well as potentially gaining fat. Again waking up during your brain recovery phase later in the night will also encourage to hit the caffeine or impact your mood that comes with lower energy that can mean anxiety, depression or you just come across to use a good Scottish expression, “crabbit”! There are many approaches to get to the bottom of why you don’t sleep properly and there are many tricks, tips, supplements and drugs to help or in many cases make no difference. However its confusing when you don’t know what to try or what you do try makes no difference or even makes things worse. As always I am a fan of running a test to see what’s going on inside your body and accurately figure it out and design a plan to help you go back to sleeping like a baby. None of my kids ever slept like a baby but they are both fantastic at it now. Answering yes to any of the above and you know you don’t have proper sleep and especially if you have tried to fix your sleep with little success then running a stress hormone test would be a great step to dig deeper and piece it all together. Now the specific benefit to running this type of test, typically these days a simple urine test, you get to see what’s called your cortisol rhythm. Basically your body produces next to no cortisol, your major stress hormone during the night and then around 6am starts to rapidly increase providing your body with the hormone and subsequent energy it needs to get out there in the big bad world and eat and move and think. This hormone response diminishes across the day with the liver going on to break more and more of it down so that by night time your bed time it’s pretty much switched off. This is called a diurnal pattern and as the hormone and stress fighting system switches off your digestion, immune and detoxification systems kick in to repair and regenerate your body for the next day, building you back up and making you stronger than before. Or thats the plan. You don’t have to run a test but if sleep is becoming your nemesis then digging deeper is less stressful long term and can be a quicker step to resolution of what can become a life long affliction, with the corresponding snow ball effect of poor sleep leading to health conditions and weight gain etc. In this example taken from a stress hormone test, looking at the red line, it’s likely the person falls asleep ok but wakes up not rested as levels are too low at bedtime and don’t pick up enough during the night. They are likely to experience low blood sugar and you toss and turn all night with your body basically looking for food instead of sleeping. Then you can have levels throughout the day that are also too high at nighttime, so you struggle to get to sleep and then spend the night restless. Another scenario could be too high during the night (as shown by the “waking” value showing the total for the whole night) and maybe along side anxiety and worry, they are switched on all night kept awake in a stress response. Stress in all its guises from life, financial and mental and emotional that we all talk about and can more readily appreciate as being negative or those that are to a degree hidden away and not always seen as sources of stress but food allergies, digestive infections, environmental toxins can also chip away at your hormone system pushing it to over react or ultimately under react to the sum of all your stress. The net effect is commonly poor sleep and of course in turn poor sleep through lack of recovery and the stress felt by the pressure to have a good nights sleep also impacts your stress and hormone function. There are many ways to help tackle this that focus on nutrition and lifestyle and in some cases its warranted that we investigate even further and run a stool test for digestive infections or food allergies that switch on the stress response at night. Also what’s called organic acid urine tests can look at metabolism and the role of your brains communication chemicals, neurotransmitters. In the absence of further testing and using the kind of information shown above you could be a lot more confident in introducing certain supplements to support your body cope with your stress and calm the body down and encourage a proper nights sleep. Professionally I am not the biggest fan of just trying this supplement then that supplement in the hope it must be doing you some good. I prefer to use some proper testing as corroboration to find out what your body is telling us is going on and use your symptoms to help further steer us in the right direction. This way its less of an experiment and more guided and personal. Bertie Bassett Liquorice Allsorts unfortunately wont have a high enough dose to support your cortisol levels but knowing when the peaks and troughs in your daily cortisol are can help pinpoint the exact timing to take a dose of a more bioavailable (useable by the body) liquorice root as a herbal tincture. If you help preserve your bodies production of stress hormone in theory you can lessen the drain on resources to produce that stress hormone. Almost as if creating the stress response is stressful. In that way less stress and a more balanced hormone production can lead to better daily cortisol rhythm, high in the morning and low at night. More stable hormones leads to more stable energy leads to someone all ready to drop off and stay sleeping when their head hits the pillow. Similar to Licquorice Root, Phosphatidyl Serine (PS) helps take the pressure off the body when under stress. PS helps lower cortisol production and if Liquorice keeps it active then PS helps blunt the stress response in the first place. This can help with anxiety and help you calm down and again if you know your daily rhythm you can more accurately plot when to take it for maximum effect. You dont want to be turning down a signal that is turned on for a reason but turning it down when its excessive and in particular with respect to sleep lowering your cortisol output later in the day can be very beneficial. If your cortisol levels are elevated later in the day you ought to investigate why, digestive infection being a common reason. That old body of yours is very clever and totally designed for your survival. You can find abnormal cortisol rhythms when the body is in defence mode, protecting you from infections by suppressing your immune system. As with many approaches to resolve health issues there are many tricks and tips that work but not for everybody all the time and thats part of the reason there is so much confusion. If you know you have elevated nighttime cortisol from running a urine hormone test the PS can be in the short term at least helpful to start the recovery process, maximise sleep to allow the body to ramp up its repair processes and in time you can find resolution. When this doesn’t happen you can more honestly evaluate role of testing or the supplement or health strategy you have employed at that point. I am always framing the nutrition and lifestyle programs I use with clients as being geared towards helping them become more robust. If you are more robust you can better cope with the crap that typically comes your way. Adaptogenic herbs help your body become more robust to take on life’s challenges and allow it to react in the way it’s designed, fight when it should fight, flight when its wiser to flight. Herbs such Ashwaganda, Panax Ginseng and Rhodiola don’t give you other problems whilst they are dong their job, like some drugs can, they function to support your physiology in a non-specific fashion. Stress is non-specific. By that I mean stress affects us in different ways, one person gets an upset stomach and the other gets a headache. Adaptogenic Herbs work in a reverse way. They help multiple functions of the body from enhancing mental function, lowering blood pressure and fighting bacteria to importantly decreasing cortisol and in turn allowing you to switch off, stay switched off and sleep. Magnesium, commonly referred to as “the calming mineral” is used with anxiety. It can help calm down those aching post exercise, abused muscles taken either orally or in the form of Epsom Salts in the bath. It has been shown to raise another of the bodies hormones, DHEA (dehydroepiandrosterone). This hormone works in opposition or a feedback loop with cortisol. Cortisol in its catabolic action breaks the body down to raise blood sugar levels and fight stress. Whereas DHEA as an anabolic hormone is released to balance and repair the body from the impact of cortisol. Magnesium works in opposition to calcium to regulate blood sugar. Poor control of blood sugar leads to highs and lows in sugars and then highs and lows in energy and the gaps in that balancing act comes from that stress hormone again, cortisol. More stable blood sugar leads to less stress and less cortisol, lower cortisol levels lead to a a balanced daily rhythm and more likely proper sleep. Poor sleep is such a huge health challenge these days and I am finding more and more that you need to help clients find effective solutions to their sleep issues if they are going to put an end to the vicious cycle of more stress, poor sleep, more stress, poor sleep that ultimately leads to more and more chronic symptoms and in time health conditions. Detailed questioning on how good or bad your sleep is, much like a health detective, does help and relies heavily on your coach or practitioners experience, whereas the right testing fills in the blanks, can hit the nail on the head and many times removes the stigma that you are exaggerating, its not the bad, or your problems are purely in your head.